I'm so excited to announce that Batello is open again and hosting weddings! The reason I'm so happy is that I absolutely loved working there with my clients and can't wait to go back. This wedding was one of the last to take place there before they had to close for repairs. Batello weddings have an awesome urban feel with an intimate space, loft look, and amazing views of the Manhattan Skyline. I'm in love with their lighting design and style. There aren't that many New Jersey wedding venues with exposed brick. I'm a sucker for an industrial wedding venue. Often, LGBTQ coupled I've encounter feel most comfortable hiring vendors that are also in the NJ gay community. 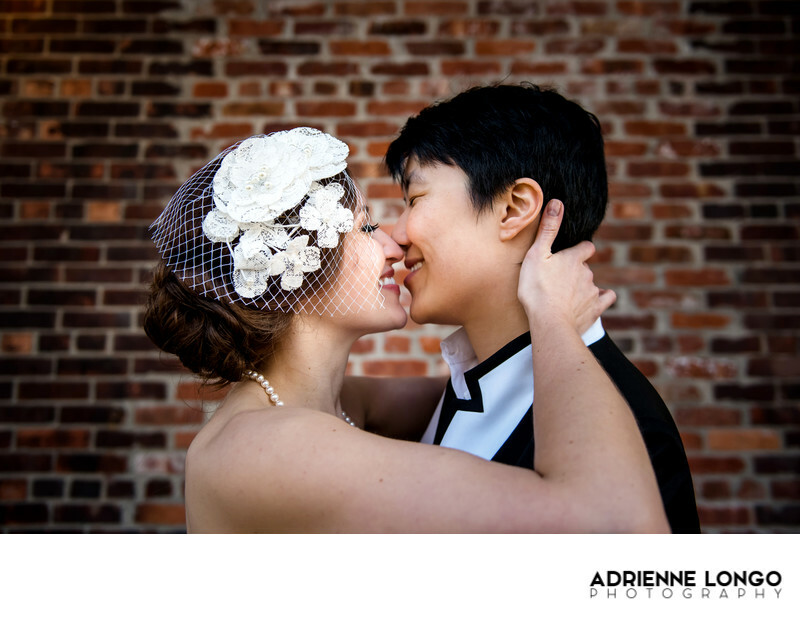 I'm proud to be able to provide that level of comfort as an LGBTQ photographer. This was one of the first connections I had with Mia & Winnie, but not the last. We met for breakfast at a cafe in Jersey City. As we talking about their wedding plans, it became quickly apparent that they were both totally obsessed with the show Friends. Check out this page to see more of their Friends themed wedding at Batello! If you've landed here, you're likely searching for a photographer who is familiar with Batello. Let's chat about your day! If this swanky wedding venue was open when I got married (this past August)we would have had our wedding there too! Batello is the perfect venue for an industrial styled wedding in New Jersey. As a wedding photographer at Batello, Jersey City, it's like a kid in a candy shop. There are so many amazing textures, colors, and backdrops, that we have to ability to make a variety of different portraits right inside the building. To learn more about how I would photograph your wedding, click here!